I don’t know if Birmingham has more or less published writers than any other city it’s size, but it seems pretty rare for someone you know to get a book published round here. It’s even rarer for that book to be almost entirely about piers. Described as “On The Road meets On The Buses,” Pier Review is an account of a possibly foolish attempt to visit every pier in England and Wales in two weeks. The launch party is tonight at The Woodman, New Canal Street, Birmingham. I spoke to one of the authors, Danny Smith, to find out more. 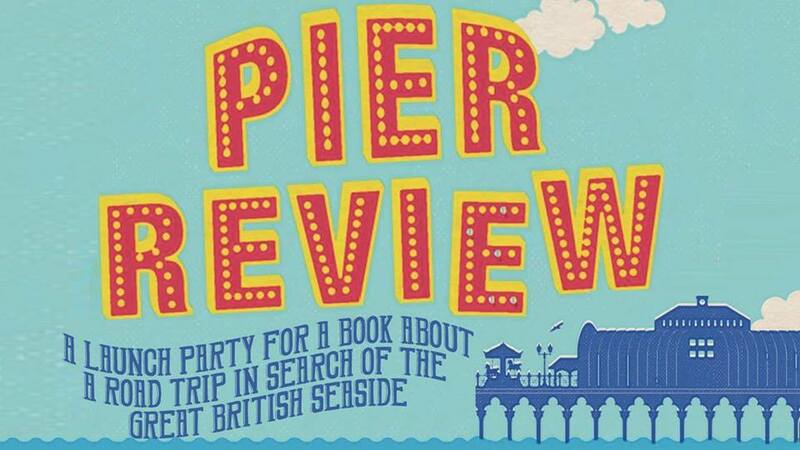 The phrase “road trip” is in big letters on the front of Pier Review underneath the title. What are your favourite road trip books, and did any of them have any influence on Pier Review? In a very general sense books like On The Road, and Fear and Loathing In Las Vegas inspired me a great deal. Yeah, I know, another white writer guy inspired by Hunter S Thompson – BOOOOOOOring (although Campaign Trail is a better book and he never really beat Hells Angels for sheer writing in my opinion). In a very real, specific sense, the book is written in two overlapping narrative of the events, that sometimes don’t fit together. This is mainly a homage to the Bad Wisdom books written by Bill Drummond and Mark Manning. While Pier Review isn’t as high weird as that, it was still important to try and infuse with that hint of weird that clings to our coast like fog. Also I need to shout out to one of my favourite books ever “Are You Dave Gorman” by Dave Gorman, which also uses duel narrators. It’s an incredibly funny book and a joy to read. The book credits two authors and you’ve already mentioned a duel narrator. How does this work and how did you both go about writing the book? Did you both sit in a room together or were you sending stuff back and forth online? Actually, shortly after we got back Jon moved to Oxford and I went to live in Brighton for a while, although we never intended for it to be a smooth transition between the two viewpoints, so we both knew we had to write it on our own and lash it together afterwards. When we finally did get together it was surprisingly easy. I think we know each others’ rhythms so well that we kinda anticipated each others’ account subconsciously when we wrote it. Jon actually can do an uncanny writing impersonation of me – to the point where he has written things as me and even I’ve forgotten which is which. Nurturing a book from initial idea to publication is a long, intensive process. Having gone through most of it, how do you feel about the book now? And are you planning any more? The book is a little more of a compromise now, after publishers and editors involvement. But I have to admit it’s better for it. Its a steep learning curve knowing when to cave and when to dig your heels in. For example I use “Me and Jon” throughout the book, despite being told at every stage that “Jon and I” is more correct. It was tempting to let it be changed but it never read as my voice so stuck it out. There’s a couple of ideas me and Jon are kicking around for a sequel if we are asked to write one. But also I think we’re both eager for the new challenge of writing something on our own. I’ve got a particular idea I’ve had for a year or so taking shape. I just need somewhere I can buy a cheap white suit. If you could take anyone living or dead to a British seaside attraction who and where would it be? I think I’d like to take William Burroughs to the decaying nightmare that is Blackpool. And anyone wishing to supply Danny Smith with a cheap white suit for his next project can contact him through the usual channels.